PHUKET: An official from the Phuket Provincial Waterworks Authority has today confirmed that power outages caused by storms on Sunday have left some residents on the island with no water supply. However, the official also confirmed that the water supply to all areas should resume by this afternoon. In addition, areas in Kathu have also been affected due to a broken water main near the Esso petrol station on bypass road according to the official Provincial Water Authority website. 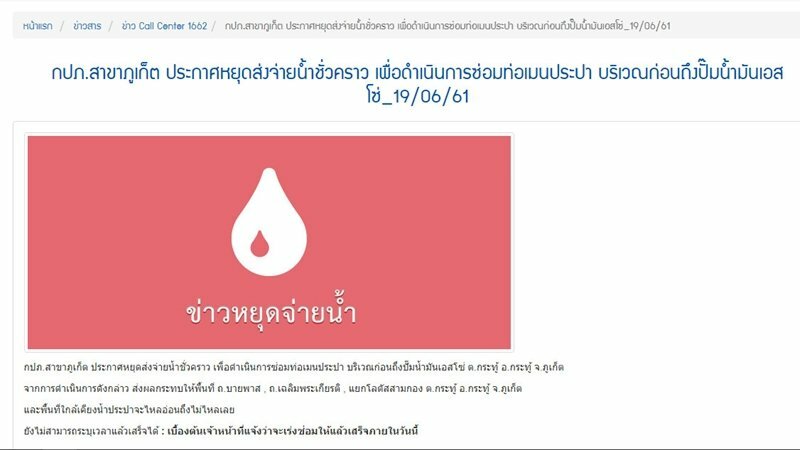 “The power outage the island suffered on Sunday (June 17) affected water being pumped from Bang Wad Reservoir in Kathu, Bang Neow Dum Reservoir in Thalang and the Klong Katha Reservoir in Chalong. “However, as soon as the power went out staff from the Phuket Provincial Electricity Authority monitored the situation for repairing the power supply and managed to restore power by midnight on Sunday,” Mr Somchai explained. “Unfortunately, it is now just a case of waiting for the water supply to reach higher areas as lower areas will be supplied a lot quicker. “However, I must point out that there a lot of areas which have been unaffected by this issue.” he added. Mr Somchai also said that once the water supply returns there is a high possibility that water will contain sediment and that this is due to pipes being dry for a long time. “Some areas may find that the water is brown in colour when he water first returns and we apologise for this,” he said. Meanwhile, properties along bypass road including the Class Act Media office have also had no water supply for the past two days, but according to a post on the Provincial Water Authority website posted today this is due to a broken water main.